I’m happy to announce we’ve made another batch of delegation enhancements for Canvas apps. Delegation refers to an app’s ability to “delegate” work to the data source instead of doing it locally, resulting in more scalable and higher performance apps. In short, Delegation = Good. For more details see Understand delegation in a canvas app. We are far from done with delegation. If you have suggestions on which queries and operations we should improve next please leave a comment or use the community forum. This one is specific to the Common Data Service. Until now we have only supported filtering an entity based on the primary key of a Many-to-One lookup. 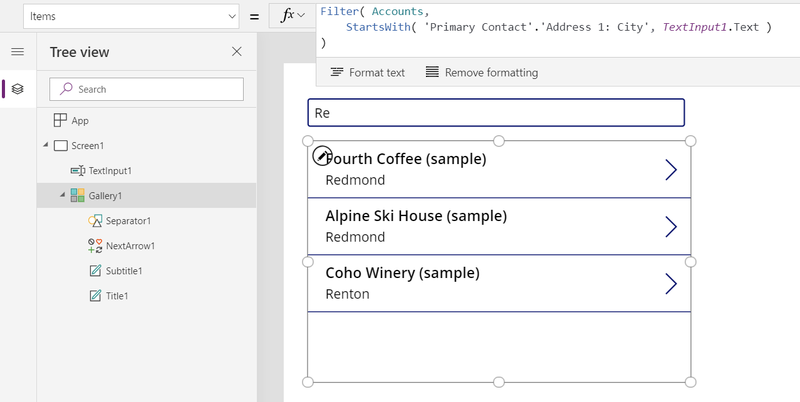 We can now filter based on other fields in the related entity, dramatically expanding the possibilities when working with lookups. This is OData speak for the formula we wrote with “primarycontactid” and “address1_city” being the logical names for our entity and column references in the formula. The IsBlank test does not appear here because it does not depend on data in the records being filtered and was handled before talking with the data source. But we can’t yet delegate the in operator, it is on our to-do list. Although definitely not the same, StartsWith can be used for many scenarios until we can delegate in. Because these Filter calls can now be delegated, we can now search through millions of records and return the first page of results quickly with the ability to go back for more as the user scrolls through them in the gallery. In the lookup filter example above, the IsBlank test didn’t need to be delegated because it could be evaluated locally before going to the data source. We will be doing more of these optimizations over time. Lots of people use the AddColumns function to bring in data from across data source, effectively performing heterogeneous joins. Until now, AddColumns would not delegate the Filter call to SQL Server in the third argument and thus only the first 500 listings would have been searched. No longer, we can now delegate all the arguments of the AddColumns function. But we aren’t done here yet. What we haven’t done is make the outside of the AddColumns delegable and pageable, the output is still limited by the non-delegation limit. If for example you attach the result to a Gallery control through its Items property, it will be limited to 500 records. Something for our next installment. A word of caution on using AddColumns in this manner. Each Filter call above is another round trip to the data source. If performance is an issue, check the network activity in your browser to understand what is happening behind the scenes. If the number of related rows is small enough, you may want to bring them into a collection and do the filtering locally. You may also want to restructure your app to only grab the related records when a user specifically asks for them. We can and will make this better in time, for example we could batch these calls for multiple rows to make this more efficient.